1. Preheat the oven to 220°C, gas mark 7. Twist each sausage in half, then cut to form two smaller sausages. Divide between six individual about 300ml ovenproof dishes, then scatter over the red onion. Place the dishes on a baking sheet and cook for 15–20 minutes, or until beginning to brown, turning half way through the cooking time. 2. Meanwhile, sift the flour and a pinch of salt into a bowl. Make a well in the centre, crack in the eggs and gradually whisk in half the milk. Beat well for 2 minutes, then stir in the rest of the milk. Add the mustard and chives, then season. 3. When the sausages are beginning to brown, remove them from the oven and immediately divide the batter evenly between each dish. Spoon a heaped teaspoon of the apple sauce into the centre of each (if you are using) and top with a little freshly ground black pepper. Cook for a further 35–40 minutes or until well risen and golden brown. Serve immediately with steamed and crunchy fine green beans. 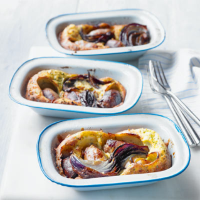 • Make one large toad-in-the-hole using a medium-sized roasting tin, and bake for 40–45 minutes, until well risen and golden brown. • Batters are the basis of many recipes, they can be sweet or savoury and vary in consistency too. Use this batter for Yorkshire puddings or traditional pancakes. Thicker, sweeter batters are ideal for American style pancakes.